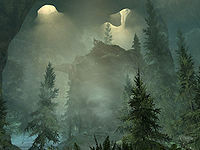 Shadowgreen Cavern is a small cave northwest of Solitude, which is home to leveled spriggans and animals. 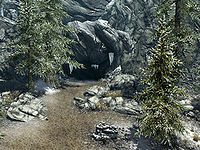 According to the marker on the map, the cave seems to be located in the mountains near the Thalmor Embassy. However, the cave is only accessible from the coastline to the north of the mountains, which can be accessed by following the road that passes the path to Solitude Lighthouse. There are five snowberry bushes growing along either side of the path, which is marked by the piles of rocks leading from the road up to the entrance, and three clusters of blisterwort fungus around the entrance. A short path inside leads to a natural cave with a central rock formation filled with vegetation and a large number of monarch butterflies and blue butterflies during the day and luna moths and torchbugs at night. There is a stream running from south to north across the cavern feeding into a pool of water and holes in the ceiling letting in natural daylight or nightlight. There are several rabbits running around and various types of fauna in the cavern. The path turns north into the cavern, and on the left is a tree stump with some mora tapinella growing on it and a bear trap beside it. The path turns to the east and passes a dead tree trunk that has fallen across the stream. On the ground at the end of the tree is another bear trap. Just above the bear trap is another growth of mora tapinella, and to the southwest are three red mountain flowers. To the northeast is another red mountain flower and just past it a blue mountain flower. Further along the shore is another red mountain flower and a purple mountain flower. There are five salmon in the pool, and on the bottom of the pond, around a half-sunken skeleton, is a leveled greatsword, a leveled shield, and a leveled healing potion. On the shore above the half-submerged mammoth skeleton are two purple and one blue mountain flowers. To the south, and to the left of the tree in that direction, you can find another red and blue mountain flowers. Heading west back to the fallen tree you will find another blue mountain flower. On the other side of the tree is a red mountain flower and to the south of it is a purple mountain flower. Look to the east now to see a massive stone pillar that has fallen over at a slight angle; the path deeper into the cavern runs underneath this pillar. As you pass under the arch formed by the fallen pillar you will see one of a pack of three wolves wandering where the path splits at a T-junction; the others can be found further along the path to the southeast. Along the eastern edge of the path after the arch there are two red and one purple mountain flowers. To the west, around the back of the pillar, is another red mountain flower, another two can be found between it and the path to the south, and another two behind the tree to the west. To the west is a ledge, and to the south you will find a rotten tree stump with an apprentice-locked chest inside. As you head back east to the main path there is another rotten stump on the right with some mora tapinella growing on it. As you go down the path, you can find a blue and a red mountain flower on the right. Another three red and two purple mountain flowers can be found along the outer right rock-wall. There is a dead elk just to the left of the path forward, as well as another red mountain flower. If you back-track to the T-junction and turn to face the path down, you can climb the rocks to the left and follow them to a purple mountain flower. You can climb the rocks on the other side of the junction, near the stump, and carefully make your way along to find three mora tapinella, two red, and one purple mountain flower. Along the path you should be able to see another fallen tree. Before that, along the right-hand wall you will find a red and a purple mountain flower, and another purple one on the left. Just past the fallen tree, a spriggan will emerge from another tree. The spriggan will call the leveled animal, which lurks just around the corner to the north, to aid it in battle. There is another rabbit running around here, a purple mountain flower to the right just before the spriggan's tree, and a blue and another purple on either side of the path after it. You can climb the rocks on either side of the fallen tree, but head to the ledge on the northern side to find two mora tapinella on either side of a large stump, and a red mountain flower. Around the corner are another two spriggans; one on the ledge to the north and the other to the west against a large tree. The one on the northern ledge is trying to blend with a stump, so its upper parts may be visible and vulnerable to a ranged attack. Under the northern ledge is a red mountain flower, and a purple one on the ledge. The stump on the ledge has some mora tapinella growing on it. To the west is a fallen tree with some more tapinella and a red mountain flower growing beside it. If you climb the rocks behind it and head north you can find another two red mountain flowers. If you climb over the rocks to the south and follow that path you will find another red and blue mountain flowers. As you climb the path there is a purple mountain flower on the left, and a corundum ore vein on the right. Before proceeding up the path, go through the bush to the west to a ledge above the pond. Two red and one blue mountain flowers can be found up here, as well as another red and a purple one through the bushes to the west. Now climb the rocks to the northeast to find another purple and red mountain flowers. As you start to climb up the path, there are four glowing mushrooms on the rock wall to the right, though only three can be harvested, and a stump to the left with a growth of mora tapinella. Further up the path the ground will shake and there will be a small rockfall. To avoid damage, retreat and hug the rock-face as soon as the ground shakes. From here you can find two red, one blue, and two purple mountain flowers as the path levels out. At the top of the next upward section is another spriggan, normally hidden against the trunk unless you attracted its attention by making too much noise below. There are two more blue and one purple mountain flowers as you reach the area with the spriggan, and another red and purple flowers as the path reaches the plateau. On the plateau is a small pond surrounding a small island with a large tree growing up and out of the cavern, but be careful as there are two spriggans and two leveled animals up here too. From the top of the path there is a red mountain flower to the north, another two red, and three purple to the east, and if you follow the path until you are facing north, another red flower. There is a fallen tree to the south bridging the gap to the island. On the island is an unlocked chest, a leveled weapon, a leveled soul gem, a random potion and a leveled potion of healing. There are two nirnroot too; one by the chest and one to the north of it. The path down is to the north, and on the bridge is a red and a blue mountain flower. While on the plateau head to the northeast edge and then look down, you should spot a chest on a ledge with no apparent way to reach it. It can be reached by facing the widest part of the ledge and using the Whirlwind Sprint dragon shout. It can also be reached with some luck by heading to the end of the bridge, facing east, and sprint-jumping off. This can be difficult as there is a protruding section of the wall to the left that means you cannot aim along the ledge, and must instead take a few steps towards the middle of the bridge and aim for the smallest edge. If you miss the ledge itself and catch the rocks just below it, you will need to turn back east to jump up. To get down from the ledge you need to face the plateau and use whirlwind sprint, or jump and hope to hit the path running up the side of it. If you miss the jump you might still survive the fall to the ground below but will take heavy damage. At the end of the bridge off the plateau, drop down to the west to find another red mountain flower and an adept-locked chest. Go through the bush and hug the wall, then take a steep drop to another ledge (it will hurt but should not kill you). This ledge has a moonstone ore vein, a skeleton of an unfortunate person with a random helmet, a medium coin purse and leveled war axe. Another red and blue mountain flowers can be found here. To leave, jump into the pond, then follow the path back out. Shadowgreen Cavern contains the highest number of red mountain flowers, the equal sixth most purple flowers in the game. It also contains the fourth most mora tapinella. This is a good place for collecting both butterfly wings and blue butterfly wings during the day and luna moth wings and torchbug thorax at night. The cavern has eleven spawn points, which is the equal seventh highest concentration of sites in the game. One of the four glowing mushrooms cannot be harvested. This page was last modified on 22 December 2018, at 19:43.